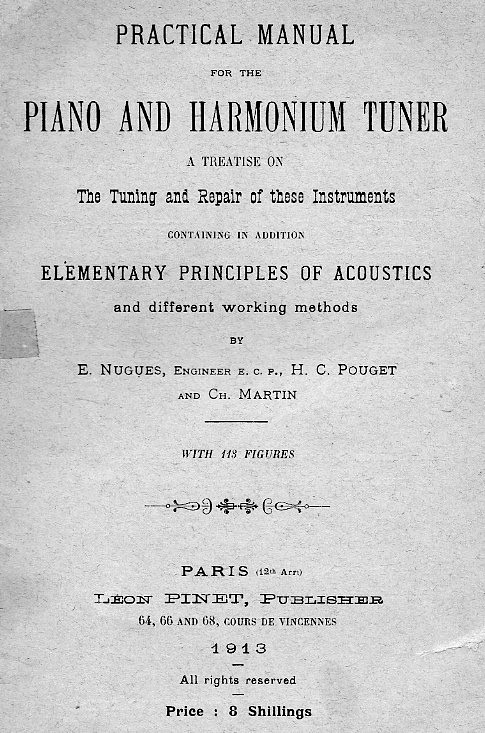 Leon Pinet Co. of Paris, France, started in the music industry in the 1840s, specializing in the harmonium business. 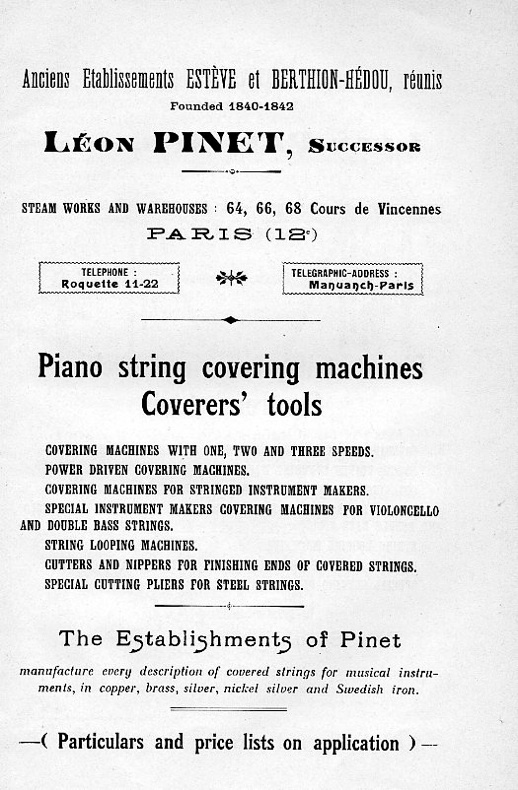 Pinet soon branched out into piano tools and supplies, and is still in business today, manufacturing hardware. They still make continuous piano hinges for general furniture and cabinetry applications. I found the following book at a used bookstore in New York in 1983. I was restoring an old harmonium at the time, and had no idea how to proceed, so I purchased this book. It had more material and information on pianos, which I found interesting, then and now. It was written for the British market. 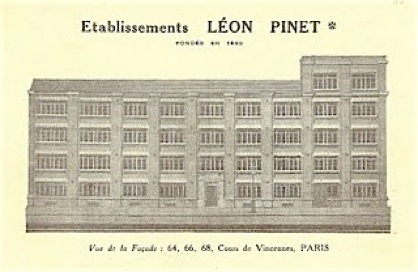 The House of Leon Pinet. 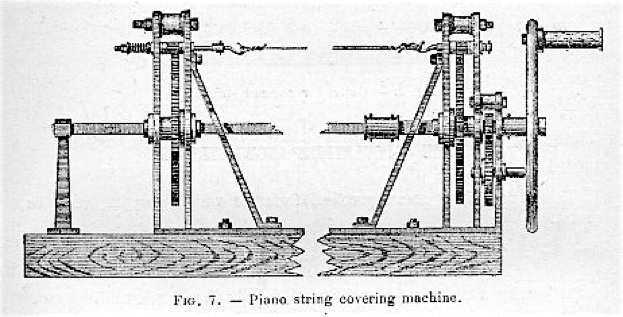 Machines were available to the industry to make bass strings of all kinds. 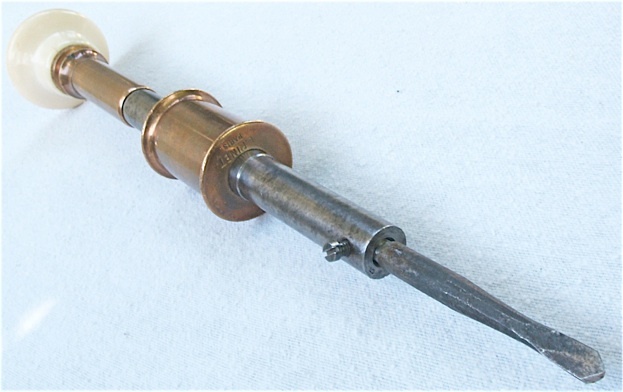 Pinet loop tool, for making the braids, or twists on the hitchpin ends of many European and historical pianos. This is the heaviest constructed stringing crank that I have ever seen. 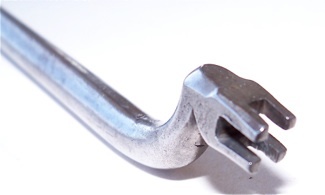 Pinet type universal tuning hammer handle. 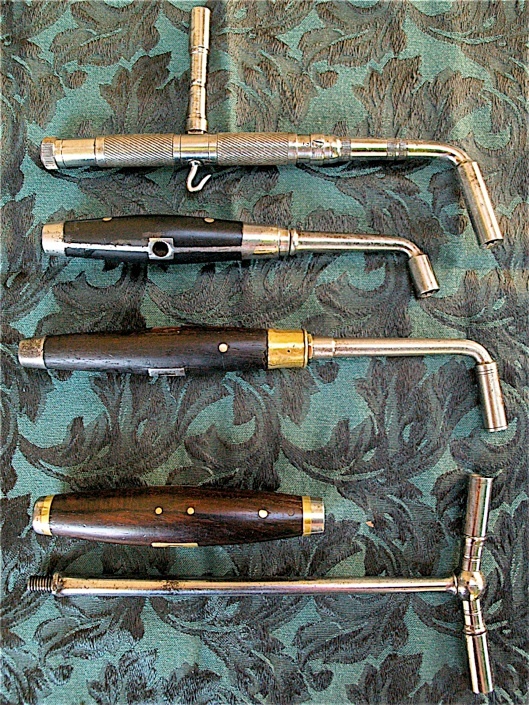 Examples of other universal tuning hammers in lever form, from top: Marque Accorda, France; Weygandt, Stuttgart, Germany; U. M. C. Co, Bridgeport, Conn. or Union Metallic Cartridge Company—the ferrule is from an ammunition cartridge; unmarked, extra long, for large square pianos. 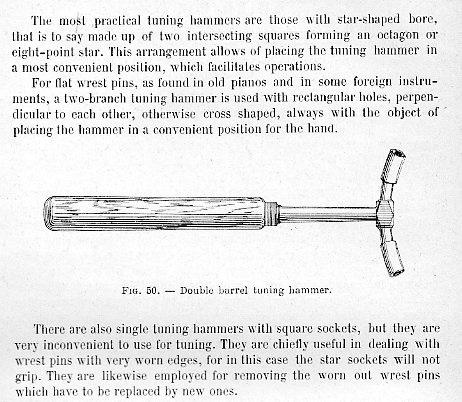 Not commonly found, Universal hammers were made during the transition from the use of ‘T’ shaped hammers towards levers for tuning purposes. 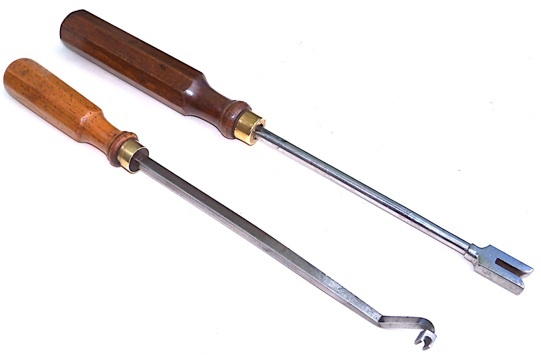 The Accorda and the Weygandt both contain a screwdriver inside the handle. Pinet piano bow drill, ivory, brass, gunmetal, and steel, done in a typically ornate style. Detail of hook at the other end of the bow. Inscription on let off tool shown above, middle. 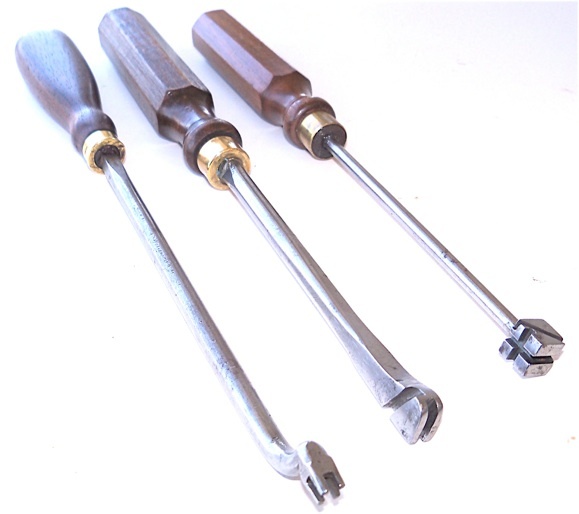 Pinet tools, with typical octagonal handles. Screwdriver, rosewood handle, bronze ferrule. 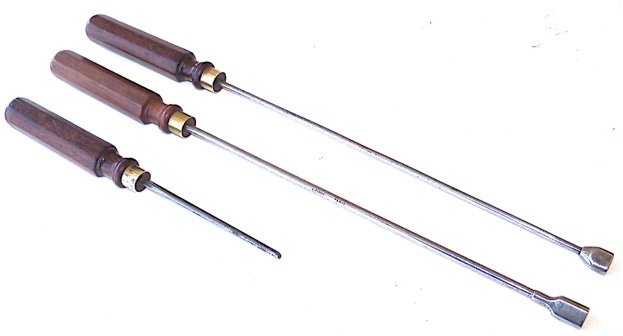 Three wire bending tools. The design of these old French tools was different than what was made in the U.S. or Japan, but was somewhat closer to some German examples. 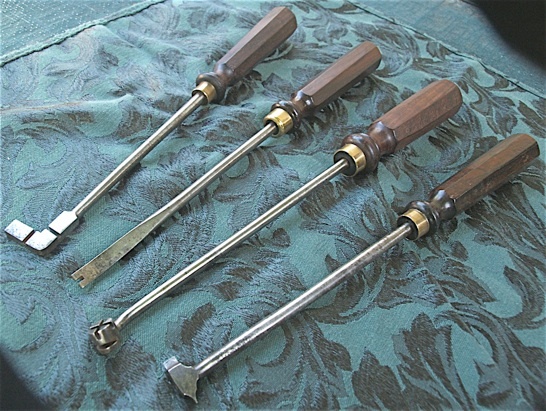 The tool in the center has bending slots in the same arrangement as the general action wire bender made in the U.S. for many years, but the shape is different. 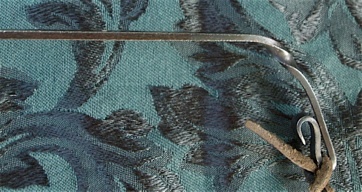 Closer look at wire bending tool, above. 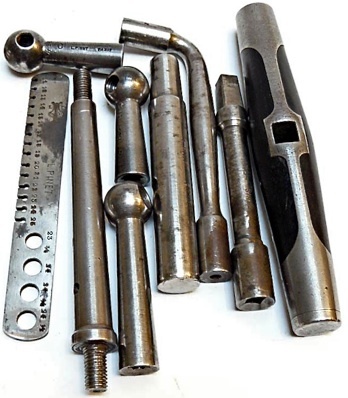 Comparison of the French wire benders and a standard H. S./ Erlandsen type. 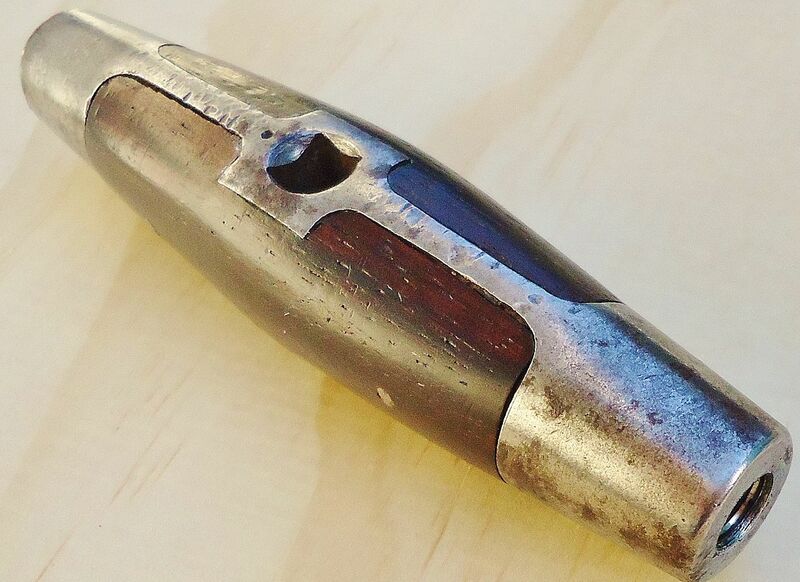 The slot at the front of the French tool is at 90 degrees, and the American type is around 70 degrees, parallel to the slot on the side. The U. S. version on the right is still sold by Schaff Piano Supply in Chicago. 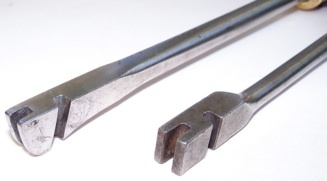 Key spacer (top), and an upright damper spoon bender. 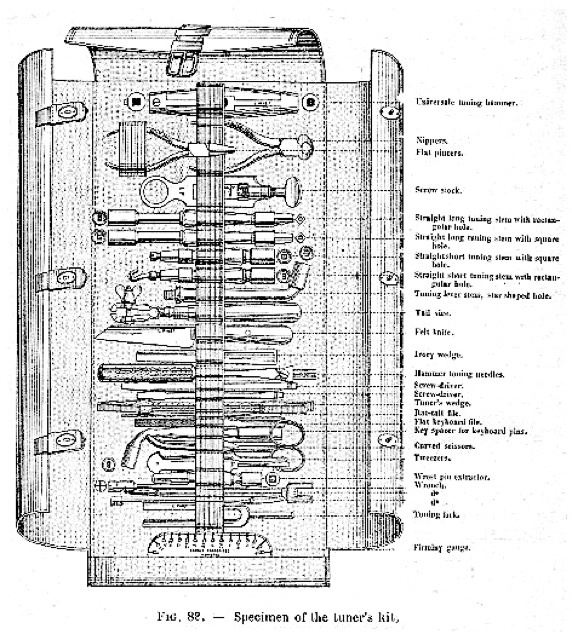 The large key spacer hardware looks close to the example in the picture called the “Specimen of the tuner’s kit,” shown further down on this page. Close up of key spacer. 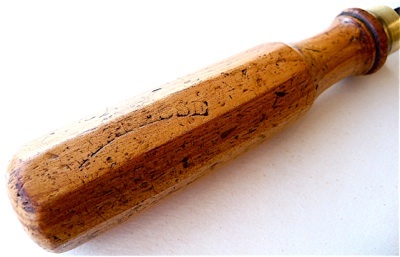 nscription on oak handle: T. L. R. Fasse—that’s the best that I can make out. 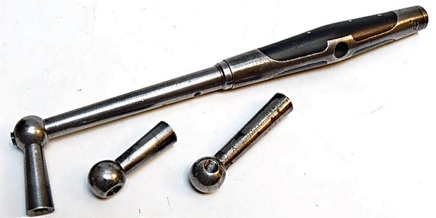 Additional Pinet action tools, including offset screwdriver for rocker capstans. 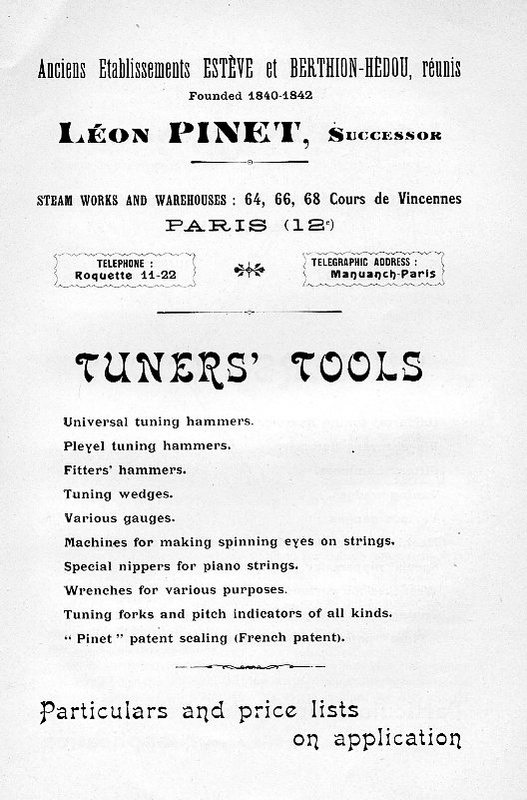 Pinet’s range of tuning tools. 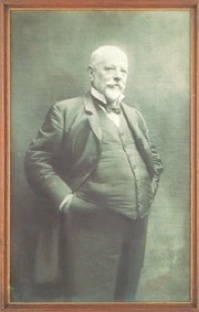 Pinet was the exclusive seller of Firminy piano strings. 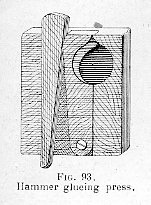 Firminy material can be found on the String Gauges page.